2. Add plain water to the tank and pump it to capacity. 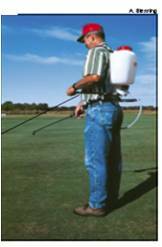 Do not add the pesticide product at this time. Put a hollow cone tip in the nozzle and adjust the nozzle to deliver a fine spray (small droplets are less apt to roll off the leaf surface). 3. Spray plain water into a bucket for the amount of time recorded in Step 2. Measure and record the amount of water in the bucket 1 qt of water sprayed into bucket in 60 seconds. 1. Pour one gallon of plain water into the tank and pump the sprayer to capacity. Do not add pesticide at this time. 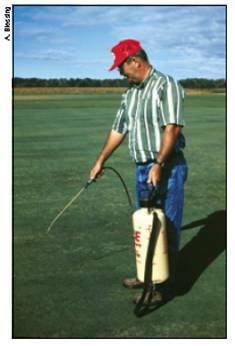 Put a fan tip in the nozzle and adjust it to deliver a coarse spray; large droplets are less apt to drift off-target and heavy enough to penetrate through the grass. Compiled by Wayne Buhler, PhD.